Sydney, Australia - 11 February 2014 - Altium Limited, a global leader in Smart System Design Automation and provider of solutions for 3D PCB design (Altium Designer) and embedded software development (TASKING), today released a new range of PCB component libraries for Altium Designer supporting a wide range of Rosenberger’s board-mount connectors. Rosenberger develops and produces a wide range of standard and customized connectivity solutions spanning high frequency and fiber optic technologies. Their product portfolio includes RF connectors, cable assemblies, RF test and measurement devices, automotive products, fiber optics, and custom copper and fiber optic assemblies. 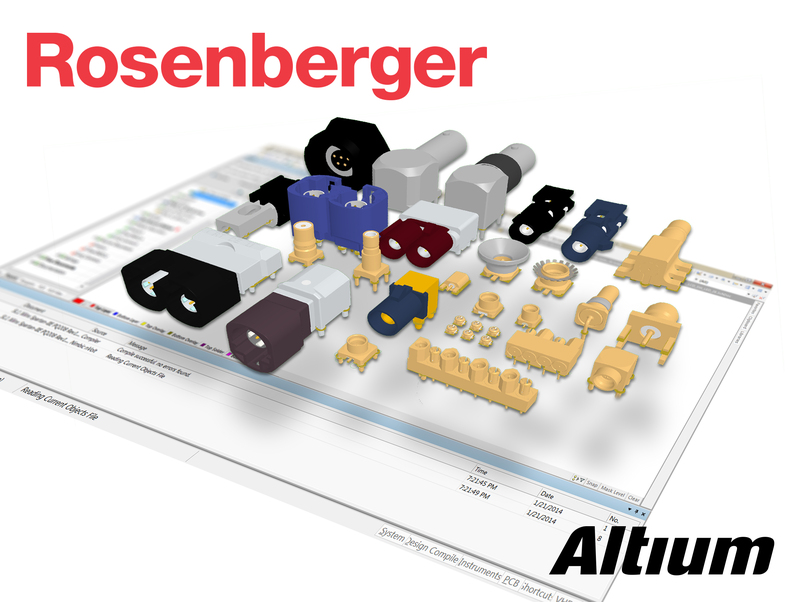 By releasing board-level components to support Rosenberger connectors, Altium eliminates the need for engineers to spend time developing PCB footprints, schematic symbols and complex 3D models. Using STEP models provided by Rosenberger, Altium can also ensure the quality and precision of the footprints, making them ready to use immediately. With the need to keep up with shorter design cycle times, Altium Designer subscriber customers enjoy access to Altium’s extensive Content Vault which includes board design support for more than 150,000 components , which now includes Rosenberger along with other vendors such as Texas Instruments, Microchip, FTDI and more. More information on board-level components and how they are accessed in Altium Designer is available from AltiumLive and in the related blogs. All connectors in this release are available from Rosenberger directly and via their global sales network. For more information, go to www.rosenberger.com. Rosenberger Hochfrequenztechnik GmbH & Co. KG was founded in 1958. Rosenberger, a family owned company, ranks today among the world-wide leading manufacturers of standard and customer-specific connectivity solutions in high frequency and fibre optic technology. The product range covers RF coaxial connectors, RF test & measurement products, RF connectors for automotive electronics, medical and industrial electronics as well as fibre optic products and cable assemblies. Renowned companies in high-tech industries, e.g. telecommunication, data systems, medical electronics, test & measurement, aerospace engineering or automotive electronics trust the precision and quality of Rosenberger products. Rosenberger is certified to ISO/TS 16949: 2002, ISO 9001 and ISO 14001. More than 1,200 people are employed today at the Rosenberger headquarters in Fridolfing/Tittmoning (Oberbayern, Germany). Worldwide, the Rosenberger group operates 19 manufacturing and assembly locations as well as the Rosenberger sales network in Europe, Asia and North and South America where – in total – approx. 5,100 employees develop, produce and sell Rosenberger products.